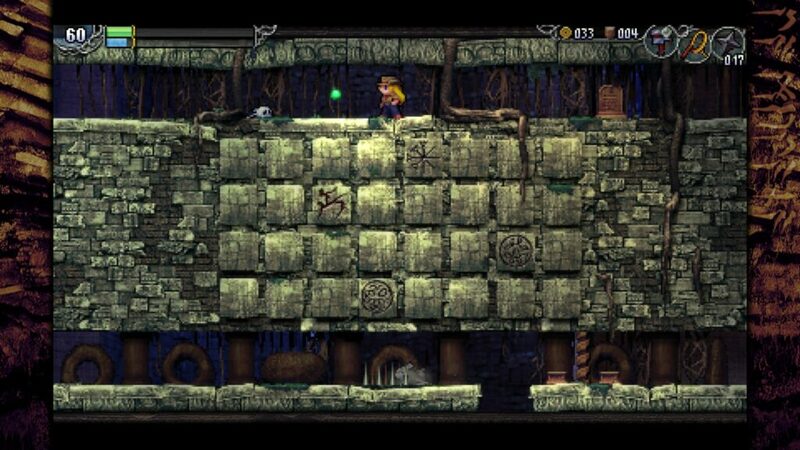 This is your base camp in La-Mulana 2, kind of like the first area in the first La-Mulana. Due to the fast travel mechanic in this game you’ll spend much more time here, and you can heal in the hot springs. There’s also some shops, not that you start with much money. Break some of the pots that are about to get a bit more money. Be sure to buy the Hand Scanner before leaving town, so you can read the text in the game. I also recommend the Map Reader which you’ll have just enough for. 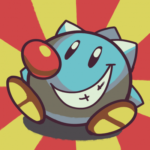 Fun fact: Xelpud is Duplex, the main developer of La Mulana. He’s a bit of a deliberate heel/joke character, hence his personality and references to video games. Don’t forget to activate Apps like the Map Reader in your menu as you unlock them, they don’t do anything if not actively set. Weights (10G): These are required to press down switches in La-Mulana 2. You’ll get some as random enemy drops, but you can stock up here if you’re in need. Yagoo Map Reader (20G): The map ingame isn’t that helpful, but it’s still worth the 20 G. You can’t read maps you find without this. Buy it with the other 20G you find in the pots in the town. TextTrax2 (50G): Saves the contents of a text box for later reading. Useful to save hints, you can buy it later when you’ve got a bit more money. Buckler: 10G. A cheap, useful (but breakable) shield that blocks most common projectiles. Worth getting before you dive in. Pistol: 200G. An extremely expensive and generally unnecessary item. It’s a boss-killer, but so pricy you might not bother. Ammunition: ?G Even more expensive than the gun itself, Ammunition isn’t dropped by any enemy I’ve found yet. Keep your bullets for bosses that are making you rage. Hand Scanner (10 G): Used to read the countless hints and lore tablets in the game. Get this. Shuriken Ammo: Can’t buy the ammo yet, but these are useful later on. Pepper (50 G): Don’t know what this does yet. Use with Y like the Hand Scanner while it’s equipped. This is basically the tutorial of La-Mulana 2. The ruins have been emptied out, except of a few bats. You’ll get a healthy dose of the lore of La-Mulana 2 via text messages and by reading with the scanning tool; note you can use the scanner even while jumping, so some suspended objects can be inspected/read too. Note that the strange barrel looking things with three white spikes on them are actually signs. Read them with the hand scanner equipped. Be sure to get the treasures in here; they’re real and essential for future play. 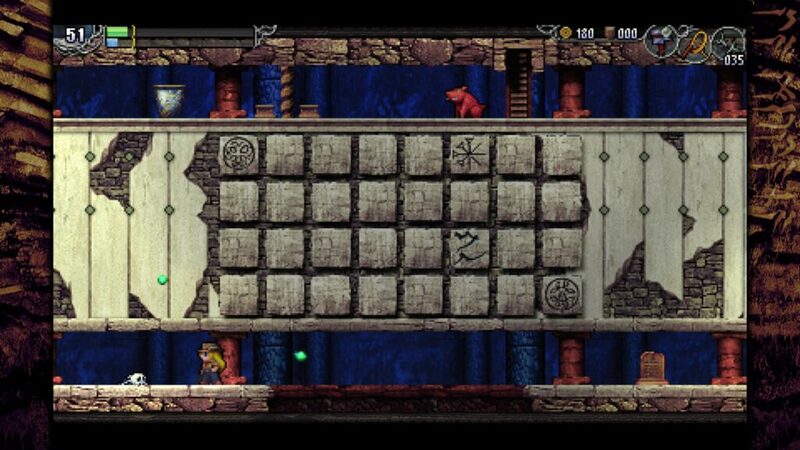 Treasure chests in La-Mulana have extremely unusual and almost always unique unlock methods, treat the whole room like a puzzle until the chest is open. The first chest just needs a weight placed on the switch; if you’ve defeated every enemy and broken every pot on your way here you should have at least one or two. Inside is the Shell Horn which notifies you of traps/secrets. Next you’ll almost certainly fall into a pit containing another chest with the Holy Grail, just below a sign warning you only a ninja/archaeologist can make a jump. Don’t be a ninja your first time; you really want that grail, it lets you fast travel and is absolutely required to beat La-Mulana 2. Below the grain is a “ladder” that doesn’t look like one. Get used to what the game considers ladders. When in doubt, always try vertical, vaguely ladder-looking things. The area’s pretty easy but note there’s a real big mistake you can make here; accidentally unlocking hard mode! It’s rather obvious what you should do to avoid it, but see the Secrets section below if you want to activate it on purpose. I won’t get too specific on traversing here, you’ll find your way. Just keep an eye out for I-beams (they can be climbed like ladders), the game can be a bit vague about what’s a wall/floor, what’s the background, and what’s a “ladder”. Not all ladders are literal ladders. You’ll be seeing this nutty boi quite often in the early bits of La-Mulana 2. Just jump to whip him in the head a few times and he’ll leave. It’s as easy as you’d expect of a tutorial boss, but remember the jump for the head strategy; you’ll be doing this very, very often for bosses. This is your first real area in Eg-Lana, the real region of the game. Be sure to save often as you explore here (there’s only the one save point in the middle however). 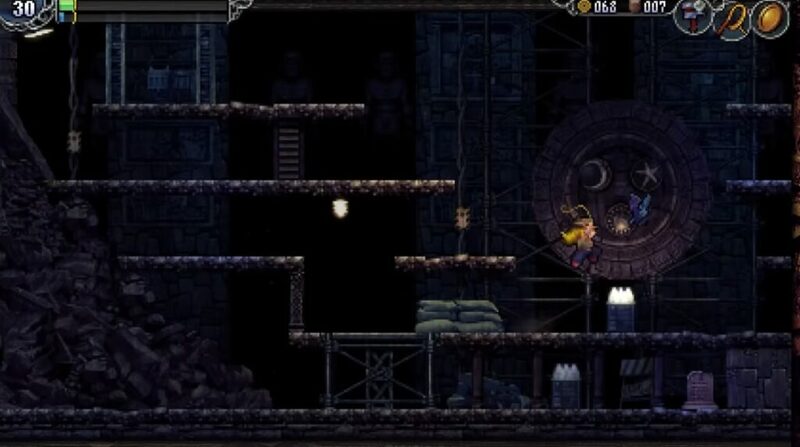 Here you’ll get a feel for how La-Mulana treats it’s players (harshly!). Expect to fall for a few traps; some obvious, some subtle. Explore every nook and cranny to get a feel for the game and unlock some goodies, but the first major goal is at the top; whip the red eyes of three statues at the very top of this area to stop the flow of poison. At first you’ll look stuck, but there’s a raised floor switch that lowers the right pillar; start looking out for these as you play. They’ll activate both secrets and traps, and often the only way to know which is to press it. Again, save often! You’ll find your first Slate here, a glowing red tombstone looking thing. Read it with the Scanner and you’ll notice the red glow stops. This is how the game marks what you’ve read. Always try to read new slates, both for hints and lore. Just to your right is a chest with a Sacred Orb, another simple switch secret. Note the enemies drop cards which let you add them to your Guide app. It’s a fun collectable, so try to get them. Boss cards are hidden (often near where the boss was), and cards for NPCs are added as you talk to them (going in doors almost always results in meeting an NPC). Climb up and right and you’ll look trapped; the stone to the left is breakable. Keep an eye out for this manner of wall; it’s very often breakable. Also try whipping walls that look otherwise suspicious…or just every wall that’s kinda big; there’s lots of secrets hidden in them. The Roots of Yggdrasil Map is in the chest here, easily opened via the switch. Continue left to find your first save point. Read it with the scanner to add it to your fast travel list. You can now travel in and out of the ruins to heal at will! Also, save. Next the Shuriken are hidden here, destroy the suspicious wall toward the bottom and use a weight to make the even more suspicious block up top. Your first ranged weapon, they’ll serve you well in just a second. Head up, left, and up again to grind the first statue to whip. Whip the red eyes and Ratatoskr shows up! You don’t have to fight him (leave with the latter bottom left) but you might as well. You can simply stand on the left platform and throw shurikens, jumping over his shots between your own volleys. After a bit, he’ll leave (again). You can’t do anything in the room to the left yet, but it will unlock. Just left and down from the entrance. Guild (50G): An app that plays a little tune in rooms with secret shops. I’d recommend getting it. Just a brief stop here to get a Sigil, but we’ll be back later. Throw shuriken at the head statue to the left to open the blue column of fire, then continue along the only path. When you can go left or right, go left to find a room with a save/warp point! Use shuriken again to break the little pillar holding up part of the area and it will collapse and let you save. Save, then go back to the right two screens. You’re about to fight a boss, but not much preparation is needed, just climb up the stairs after a save. Requires Birth sigil, left then down from the save point. Alert App (80G): An alert that plays a sound when there’s something fishy in the room. Shuriken will again be of much value here, but aren’t necessary. One of the birds will rest while the other is attacking, and one starts the battle resting. It’s possible to defeat the first bird before it takes off simply by whipping it, but it’s best to get a few hits in, let it take flight and bully the other one when it tests. Defeating the birds gets you the Origin Sigil, a very useful item that will light up Origin (1) sigils, allowing you access to several chests and the next area, Annwfn! You can leave the Divine Fortress for now. We’ll be back soonish. Drop (carefully) straight down and almost immediately find the save point and fast travel spot. Save. First we’ll need to get something that moves these white boxes. From the save point go left through the water room (it’s poison, but very slow poison. You’ll live). Take some time to familiarize yourself with the water controls; they’re a bit odd. You have to “jump” downward to swim down. Next go down, then right to find a room with a treasure chest. Kill the skeleton guarding it, then look left away from the chest, standing still for a bit. The chest should open, revealing the Glove item, which lets you push white blocks. If you fail and the thing starts shooting arrows at you, just leave the room to reset it. You can go left and down from the room with the Glove to find a wide room with a well leading to the Immortal Battlefield. To your right is water and Cetus the boss, so go left first. In this first room you’ll find the Earth Spear, needed to press the little brown switches under the floor. Continue down then left from the upper part of the lower room. Use your new Earth Spear to open a path and push the white block to it’s slot. The chest opens, but you can’t reach it–except you can. The top of the upper right wall is hollow. The tile just above the spikes is a trap, jump over it and claim the Gale Fibula; the last item we need to finish Annwfn. Remember to unequip the Gale Fibula to stop running every time you tap a direction. Save after getting each new item. You can leave the Battlefield now. You can now travel right from the entrance to explore more of the Immortal Battlefield if you like, but it’s not necessary yet. We’ll come back here with more powers later. Honestly the easiest way to deal with the boss is to simply throw 20~ Caltrops from the ledge on land, after swimming out to trigger his appearance. You don’t need to fight him in the water at all. After beating Cetus you’ll keep going right to see your dad, fall in a pit, and find a Save Point and unlock fast traveling to the Battlefield. There’s a lot of exploring to do beyond that save point, but almost all of it requires items you don’t have yet. You can however get the Chain Whip from a block puzzle. In the room with two white boxes and some lava, push down the lower block from the right, then push it onto the switch to the left. Then, quickly swim through the lava (the Fairy of Life in a nearby room can help) to get back to the top of the room without transitioning rooms and resetting the puzzle. Push the top block left, then onto the right switch. Tada, claim your Chain Whip to do double damage with your base weapon. The Shrine of the Frost Giants can be accessed from a door requiring two Guardian kills, left and down from the first save point in Annwfn. It doesn’t require anything special that you don’t already have to reach. Note that a LOT of weights are required to progress here, and there’s a few places that will simply waste weights. There’s not a ton you can do here on first entry, but the Birth Sigil is here. You can leave once you get it. Be sure you activate the save/fast travel point here. The Birth Sigil can be reached by falling through the thick snow in the room right and down from the save point. Fall from a great height to drop all the way through the snow (other snow piles here exhibit the same mechanic!). Once you have the birth sigil there’s not much you can do here. A boss you’ll eventually need to fight is up above the tall room to the right of the save point. You can clear it out now if you like. You’ll find 3 super cute vampire looking girls here. Fight them to show their true form. Not a super complicated fight, but good jump timing will help. Found by using the Blood Corridor gate in Valhalla, you can fight Tezcatlipoca as soon as you have the Gloves. He seems impossible at first, but you can simply push the large ice cubes over the edges to hit him. He’ll die after only three. The ice cubes are instant death however so don’t let them squish you. Actually accessible before Root of Yggdrasil is even cleared; defeating Nidhogg, which isn’t too hard via spamming ~50-60 shurikens, allows you in. The Grapple Claw can be found right and down from the entrance, after a cameo by your dad. It requires nothing but a weight to unlock. Most of the rest of this area is much too dangerous/difficult to traverse when first possible. 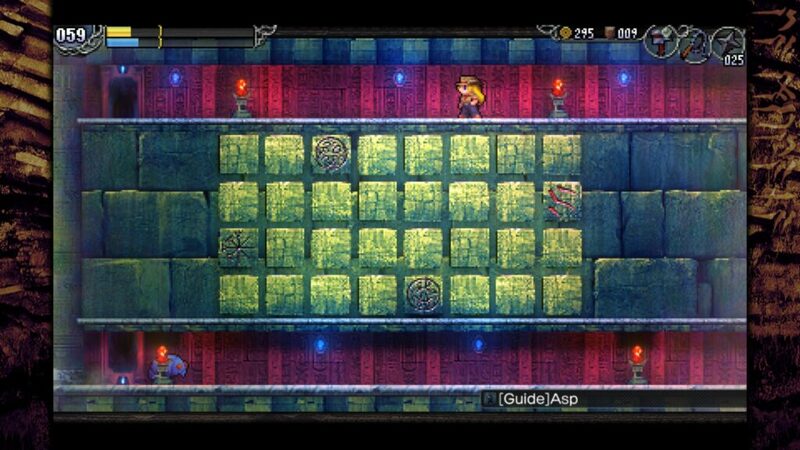 Costumes in La-Mulana 2 are unlocked via special heart-logo keys. Kickstarter backers start with keys to unlock the chests early, but enough keys to open all chests can be found by thoroughly exploring La-Mulana 2. I haven’t successfully opened any chests yet so I’ll be adding them as I find them. Two rooms down from the main fast travel/save point, then right and up is the entrance to an empty looking cave. There’s a large sign you need the Snap app to read, and the Valkyrie costume chest. 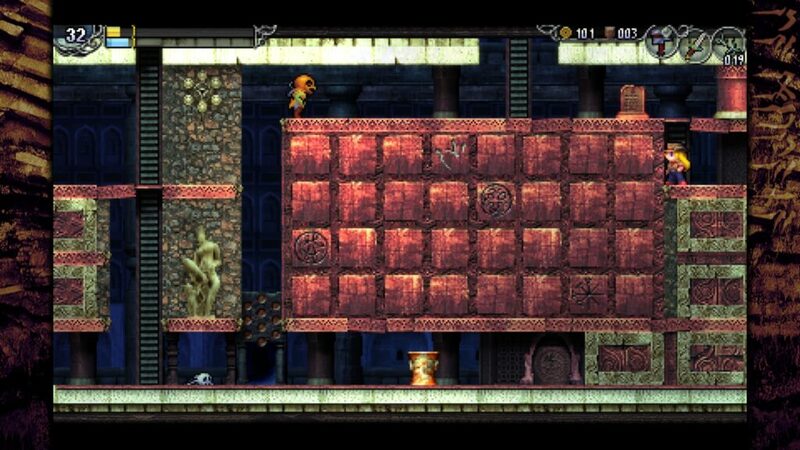 Don’t keep doing all the way to the right after the chest; leaving that way kills you (what doesn’t in La-Mulana-2?). Starting weapon. Nice wide attack range, but a bit slow and initially weak. A fast weapon with a short range. Does more damage than the stock whip. Moderately fast weapon with a long forward range and rapid thrusts when used with Vajra. Slowest weapon, with an okay arc and no combos. Location: Gate of the dead. Slower weapon with a wide range. Your first ranged weapon, very useful due to it’s range, but low damage. Shuriken, but they roll along the floor. Can activate switches, even those in narrow gaps Lumisa can’t crawl in. Thrown weapon that penetrates the ground. Can be used to hit little brown switches in various places. Can be aimed neutral, higher, or straight down with the d pad. A weapon thrown behind Lumisa to damage enemies. Can be used to some effect to hit enemies outside normal range, such as below you (easy way to cheese out Cetus). Lumisa will take damage if she touches one. Damage boosts possible. High damage weapon that returns (or drops as an item) after most attacks. It has a low item cap and drops rarely however. Don’t use it against enemies that can’t be killed by normal attacks (crystal skeletons), it won’t come back. A very high power, extremely expensive ranged weapon. Don’t waste the bullets, but it can cut some bosses short. 500G for a refill, yikes. Not really a weapon, but blocks common ranged attacks. Breaks after a while, but can be re-bought. Must be equipped to actually block. Shield that never breaks, but it may be forcibly put down after repeated attacks hit it. A jewel that destroys the Ankh sealing each Guardian (major boss). You need one to fight each major boss, thus each area with a major boss usually has one somewhere. These raise your HP by 32 each. Allows you to cast Mantras that have been recorded with the Snap app and set with the Mantra app. Can absorb purple Dissonance clouds and use Dissonance to rotate the Corridor of Blood. Activates an ancient vehicle…not sure which yet. Needed in Dark Lord’s Mausoleum. Not sure what these do yet. Needed to trigger the white switches in Gate of the Dead. Sounds like you can use it near Brahma to make him speak. Not sure where Brahma is though. These activate their corresponding Sigils in rooms, allowing them to be destroyed and their linked puzzles solved. 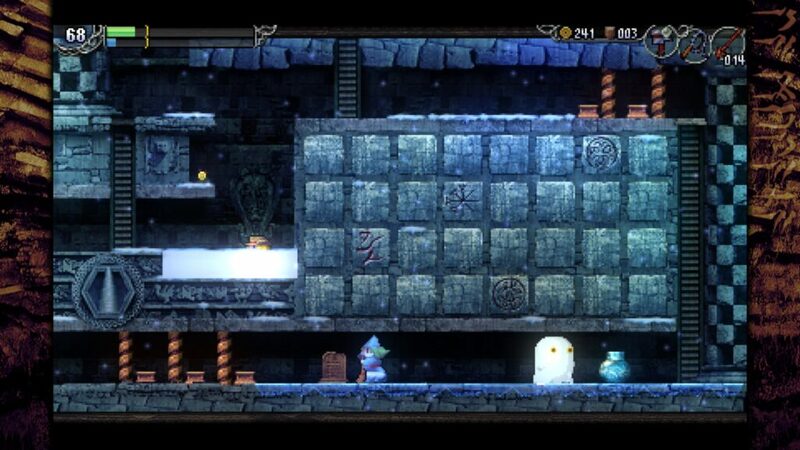 These hard-gate several locations in La-Mulana 2 that could otherwise be sequence-broken. Found in Shrine of the Frost Giants under a pile of snow you have to fall through from a great height. Activates puzzles requiring Birth seals. Lets you push the common white blocks, as well as a few other pushable objects. Lets you cling to walls by holding up as you land against them, and spin around on mirror-sheen columns and icicles. Lets you treat normally in snow/ice. Run super fast after a bit of a startup. Sometimes you need to start farther from your target to outrun traps. Hold up with Grapple Claw equipped to cling to a wall you hit instead of bouncing off. Unequip it so you don’t run constantly. You can jump while running. Unlocks weapon combos for all primary weapons but the Axe. These let you attack much faster by repeatedly pressing attack. Almost neutralizes damage from Lava and greatly reduces Poison Lava damage. Removes poison damage from water. Plays a chime when activating traps/solving puzzles. Lets you fast travel between save points. Lets you buy fairies’ freedom from the disgusting creeps. Location: Fairy’s hideout after it’s opened up in the Giant’s Mausoleum. Not sure what this does. Allows you to add Prayer Altars to the Holy Grail’s teleport menu. Read the prayer altar with this in your inventory to activate it. Prayer Altars can’t be saved at. Requires the Future Development app to actually let you travel to them. Required to fight the second Guardian, Kjata. No fun MSX references for you, just a dumb tablet. This is what your Apps menu uses, and serves as the menu UI in general. Four fairies are in the game and can be summoned at fairy points to help. The Life fairy is free to start with, and the other three must be freed by finding the Fairy Guild Pass (in Icefire Treetop) and buying their freedom at hidden shops. The healing fairy is unlocked by default, found in sparkling spots across many maps. The weapon fairy Kara, she is imprisoned in Shrine of the Frost Giants and costs 300G to free. She attacks enemies around Lumisa at regular intervals, and persists a pretty long time. The prosperity Fairy is locked in Dark Lord’s Mausoleum and requires 300G. Allows transportation to Prayer Altars (Totem Pole), or Red save points. Majorly WIP. Which race belongs to which area is relevant for puzzles/hints so I thought I’d start recording them. Home of the Aesir and Vanir, 6th children. Also the home of the two Dwarves. Home of the Alfr (fairies), the 6th children. Home of the Amarna and Ennead and home to the evil god Ra. I don’t know what these are exactly yet, but I’ve put them up here because I guarantee there’s a puzzle using them. A tablet in the Mausoleum of Giants, very early in La-Mulana 2, will curse you if you read it twice, giving ample warning that doing so is bad. However, rather than an instant death or temporary inconvenience, this is a real curse that permanently (if you save after it) turns that save into hard mode. In hard mode many, many more enemies will spawn and the game will generally be really painful; La-Mulana 2 is already very hard on it’s own, so I don’t recommend this for first time playthroughs! Even if you activate the tablet, you can avoid Hard Mode by just quitting after triggering it and not saving. Once you save, you’re on Hard Mode. You can see me finding the Hard Mode tablet here. It takes me a couple minutes to go back and read it the second time to show the effects. I found a potentially useful trick with the wall-cling. Needs the Claws item to grab first, at least to make the timing much easier. There’s a known bug with PS4 controllers and La-Mulana 2. There’s a workaround on the steam forums though it’s rather extreme. Once in a while it works flawlessly after I fiddle with Steam controller settings, but then it’s back to screwed up later with the exact same config, so I don’t think that’s a real solution, I think the bug’s just semi-intermittent. The bug’s frustrating enough I’ve personally generally just used an Xbox One controller, though diagonals don’t seem to work perfectly on that in game sometimes. The Switch Pro controller appears to be completely nonfunctional regardless of Steam controller set up, and acts like it’s constantly spamming buttons. Have found no workaround for this. 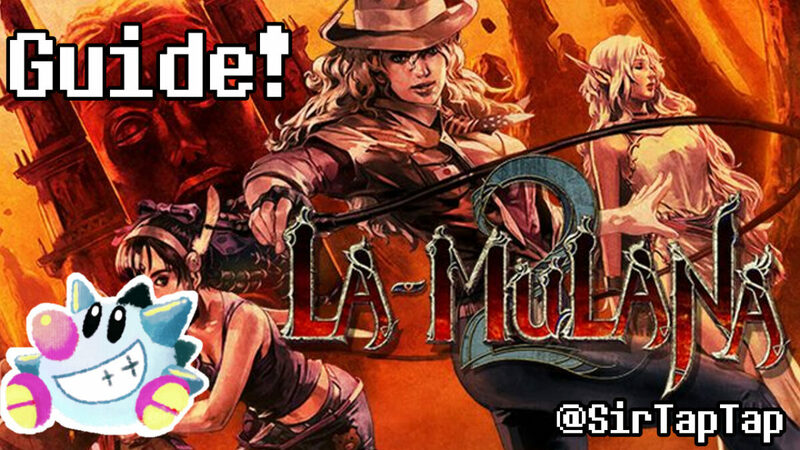 Sometimes a video helps, so here’s La-Mulana 2 walkthrough videos by me as well! Support the guide-writer on Patreon! I’ve been livestreaming my La-Mulana 2 playthrough on YouTube, so feel free to watch that for entertainment or guidence. But be aware I sequence break very hard, rather early, so the path I take is not the recommended one. But it’s pretty interesting all the same. An hour into this one the playthrough goes totally off the rails as I think I can’t open a chest that gives me the item I thought I needed to open it! The result is major sequence breaking goodness, but also lots of dead ends. I’m not supposed to be in ANY of these places yet. I actually find the Earth Spear and think I’m sequence breaking, when I could have found it ages ago the right way. Finally back on sequence when I go back and get the Gloves. Feels weird to make proper progress again and keep finding items.